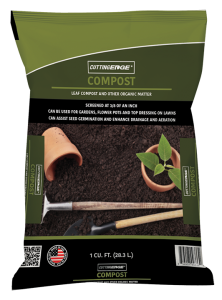 Cutting Edge® Compost can enrich your soil with nutrients and organic matter. Our 3/8” screened compost, composed of composted leaves and other organic material, can dramatically improve drainage and soil aeration and can add essential elements needed for lawn and plant growth. Composted leaves can be rich in the trace elements that soil needs, and can contain a higher level of mineral content than manure. It also can be excellent at retaining moisture, reducing water evaporation, attracting desirable soil micro-organisms and maintaining a more even temperature of soil. Cutting Edge® Compost is perfect for commercial and residential use and can be used for gardens, flower pots and as a top dressing on lawns, as it can assist in seed germination. It can also be used in lieu of peat moss, mulch and straw for plantings. When used as mulch, our compost can reduce drought damage to plants and can reduce soil compaction. Our unique UV and water-resistant, non-slip packaging can provide extra protection for outdoor storage and can provide a nutrient-rich compost year after year. Available In 1 Cu. Ft. Bags!